You are playing in a multiple-deck game. You've been dealt a five and a four for a two card total of nine, while the dealer flips a two as his upcard. Obviously standing here is out of the question. What it comes down to is a decision as to whether you're going to hit the hand here or double down instead. Which one of these routes do you choose to take? The dealer is obviously not in the most vulnerable position, because when holding a two he'd have to draw two ten value cards on his next two hits to bust, or otherwise, you'd have to hope for a wild multi-card combo to eventually put him over 21. This is admittedly a close decision, but we hold off on doubling. In this situation, you're going to win more hands than you lose in the long run. 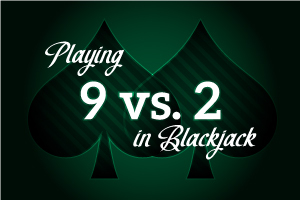 By always doubling down, you're going to win three more hands per hundred, on the average. So the question which has to be asked is, does hitting the hand win for you at twice the rate? The answer is YES. Hitting the 9 against a two will get you 49% winners, approximately 42.5% losers, and 8.5% pushes. As a result, you are mathematically correct in hitting the hand. Card counters will use this as a Basic Strategy variation when they know there is an abundance of ten-value cards and therefore a better chance of winning.